& find the beauty within your mess! A mini (2-card) intuitive reading with a message and activation for you. Includes light language & song transmission, and uses the Messy Jesse Art Cards. Do you struggle with loving yourself, and feel like you are a “mess” or not enough? Do you desire to begin loving your mess and accepting all the parts of you, even the parts you judge as not enough? Whether you have a specific question or challenge you want guidance on, or just desire to receive a timely message from Spirit, this Love Your Mess Reading will bring you inspiration, guidance and a reminder of who you really are and how very loved you are. It will help you to see the beauty within your mess! 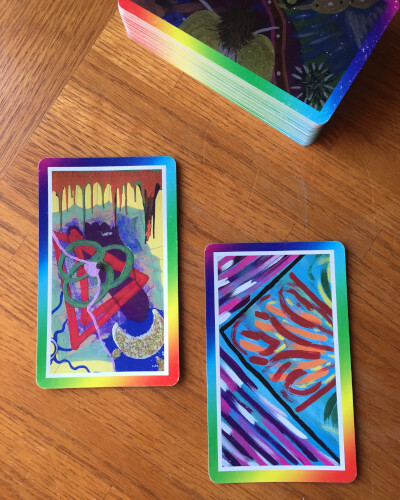 These intuitive readings use the Messy Jesse Art Cards (with artwork by Jesse), and all readings are delivered in an MP3 audio that you can listen to over and over to really integrate the information you receive. Each reading comes with an image of the cards plus the channeled message / interpretation by me with anything I get for you as I’m doing the reading. This MINI reading is a 2-card spread. If you want more than just a mini reading, check out the Love Your Mess Intuitive Readings or Love Your Mess Intuitive Art.